Playing golf with etiquette - Trollies and Buggies. Correct use of buggies and trolleys on the course is essential for maintaining good turf conditions, and also for the safety for both users and other golfers. The USGA (United States Golf Association) has produced this video to help golfers understand good etiquette. Please be mindful of the points made in the video in your next round, to help our course develop and improve. The associated article, from Greens Director Andy Booth, highlights the impact that trollies and buggies have on the golf course, and therefore on our game play. Please keep trollies and buggies 10 yards from green surrounds. Turf injury - The wear damage caused by trollies and golf carts. Studies repeatedly show that golf trollies and golf carts cause damage to grass on golf courses. Firstly, they cause surface scaring and secondly, they influence soil compaction which dramatically affects root growth. 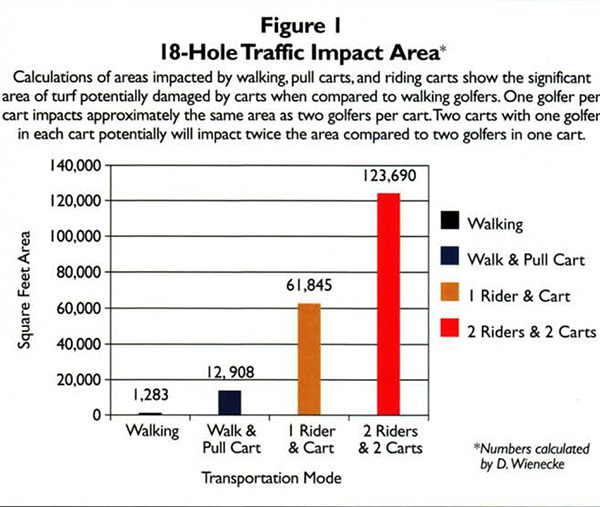 The additional weight of motorized trollies and golf carts causes compaction beneath the surface. This reduces the shoot growth rate and the recuperative potential of turfgrass. Compaction reduces air and water porosity within the soil as well as water movement through the soil profile. Soil compaction can impact on turf growth for several weeks or months, resulting in the total loss of turf cover and chronic problems with poor drainage and the invasion of weeds that prefer compacted soil conditions. Examples of this compaction affect are evident in many locations around the course particularly between bunkers and greens where traffic levels can often be concentrated over small areas of ground. The use of white hoops has helped direct traffic however there are limitations on how many we can use. Looking at the left-hand side of the first hole as an example I am sure many will recall the bare ground we had prior to their use and the difficult lies we encountered when missing a green by only a yard or so. To help minimize the damage trollies and cart present to our golf course I ask that you please follow one simple rule. In doing this you will help maintain the visible grass and underlying soil structure thereby enabling more consistent growth and playing conditions around our greens.